Umaril the Unfeathered is an Ayleid sorcerer-king who once ruled Tamriel and enslaved the human population. Umaril is a "half-Elf", born of an Ayleid mother and a divine father. 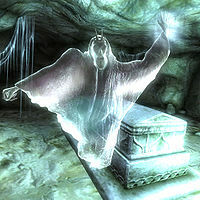 His alliance with Meridia granted him immortality: upon death, his spiritual form would live on and inevitably return. Thus, Umaril would "never know death". 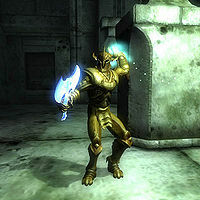 Umaril is similar to Meridia's Daedric servants, the Aurorans, though much larger. He favored "ruin-from-afar", preferring to send minions to attack and weaken his foes before he would risk direct combat. Umaril was defeated by Pelinal Whitestrake at the start of the First Era during the human uprising against the Ayleids, their "Slavemasters", and the fall of the White-Gold Tower. While Umaril escaped death, he was cast adrift in the "waters of Oblivion", and many thousands of years passed before he could return to Mundus. His return at the end of the Third Era is to seek vengeance upon the Divines who had brought about his fall. 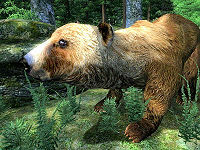 Aurorans under his command desecrated the chapel of Dibella in Anvil, and later the chapel of Mara in Bravil. In order to defeat Umaril, he must be conquered in both the physical and spiritual planes. 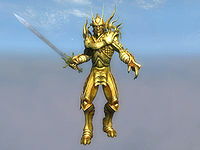 The eight Crusader's Relics originally used by Pelinal can help to destroy Umaril's physical form, but in order to reach the spiritual plane, a ninth item is needed, namely The Blessing of Talos, bestowed by Talos (who was not yet one of the Nine Divines when Pelinal fought Umaril). This blessing allows the Divine Crusader to follow Umaril into the spiritual plane, where a second battle must be fought to truly defeat Umaril. Esta página foi modificada pela última vez à(s) 11h19min de 5 de outubro de 2013.